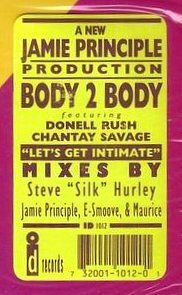 The mixes and the dubs: Body 2 Body - Let's Get Intimate (1992)Not one but two Fist fusions! Not one but two Fist fusions! First heard this on the wonderful Nineties Club CD Maxi Singles blog in late 2008 and immediately thought it was brilliant. With two of my favourite singers from ID Productions (Chantay Savage and Donnel Rush) and some excellent mixes from Steve 'Silk' Hurely and E-Smoove, I actually sang it practically non-stop for a week. I'd seen on Discogs that there had been even more mixes available at the time, but eventually forgot about it. And yet, it kept popping back up on my iPod, and eventually I went back to the original post, saw that the CD-single was originally from Germany and had a look on amazon.de. There it was, still available, with more mixes, for just under 2€! Definitely a bargain. I bought it immediately. First, I mixed the Hurley and E-Smoove mixes together, trimming both of them down a bit; the Hurley mix is a little too long in my opinion, repeats itself a bit, and the E-Smoove mix had a few bars of nasty keyboards that I eliminated. The two mixes are very different and hide the fact that you are basically listening to the same song twice. Then I also took the two Jamie Principle mixes, one of which was basically a bonus beats, and stuck them together to make a decent-length extended version. It is filthy, in a good way. I imagine this is what people danced to in opium dens in 1992. "Let's Get Intimate" by Body 2 Body.